Michel Wiener, La Poste Mail Division, Director of Communication and Institutional Relationships. La Poste is the largest French and 2nd largest European postal operator with 300.000 employees. The Group consists of Mail, Parcel-express (Parcel delivery), La Banque Postale (The banking subsidiary) and the retail brand (Post offices) (1). La Poste Mail is the largest division, generating half of the Groups revenues (11,3 billion euros in 2008). Michel Wiener is Director of Communication and Institutional Relationships. I would like to thank him for his participation and cooperation. CR endorsed. Sustainable development has been placed high on the corporate agenda by the Group director Mr Bailly. Since 2005 a yearly report on corporate responsibility is published. WWF Partnership. In 2008, the corporate responsibility activities of La Poste have been strongly reinforced by the partnership with the World Wildlife Foundation (WWF). Both parties will jointly develop sustainable solutions. Four key goals. The Mail Division has committed itself to 4 specific CR goals : (2). 1. Sustainable Transport. 100 000 post men cover yearly 76 million km using 49 000 La Poste vehicles. La Poste has the largest company car fleet in France. Evidently, it is representing a substantial share of green house gas emissions. La Poste takes its responsibility. 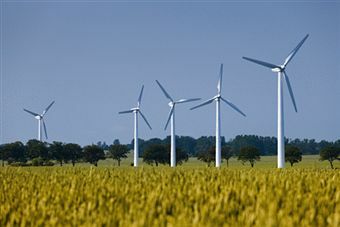 It aims to decrease its emissions by 15% before the end of 2012. ‘Eco-conduite’ trainings have started to learn employees to drive in a fuel effective and eco-friendly way. Since the start of the project, already 47.500 employees have been trained. Moreover La Poste is extensively investing in electric car development : It aims to have the first 10.000 electric cars on the road in the coming years. 2. Responsible Mail. La Poste want to contribute to ‘Responsible Mail’ by using more paper with the FSC label or recycled paper. By 2012 all internally used paper should be recycled or FSC paper. The current product portfolio is being studied and redesigned. An example is the ‘eco-carnet-timbre’. 12 instead of 13 postmarks are printed on the same paper surface, meaning a more effective paper use. 3. Sustainable Buildings. New buildings of La Poste will be built inspired by the French HQE criteria for sustainable development in the construction sector, among them are the postal sorting centres in Faulquemont, Montpellier and Montelimar. 4. Employment Quality. La Poste wants to be a reliable and good employer. This means job security for its employees (CDI, contrat de travail a durée indéterminée). Since 2004, 16.000 temporary working contracts were transformed into permanent appointments. Sustainable Purchase. Apart from the 4 key objectives, La Poste is a driving force in sustainable purchase. The post men of La Poste Mail wear professional outfits made of bio and/or solidary cotton. The cotton is produced in West-Africa and India with special care for environmental issues. The choice for bio and fair trade cotton contributes to improve the living conditions of cotton workers in developing countries. As of 2006, more than a million bio and fair trade produced clothes have been ordered by 140 000 postmen. Yes it is. Wiener confirms that Sustainable Development is a motor for Innovation at La Poste. It is true for various products and services such as the eco-carnet but also for new packaging and processes. Electric cars. La Poste’s engagement to develop electric vehicles is probably the most appealing example. The company cooperates with the French state and French multinationals EDF, France Telecom, GDF-Suez and Veolia to stimulate automotive manufacturers. In 2009, a grouped Requests for Proposals has been created with a substantial economies of scale : 100.000 cars are ordered for the next 5 years. The large scale will help to reduce the invetments risks of manufactureres and therefore stimulate the development of electric cars (3). More Transport Innovations to come. La Poste does not just stick to cars but also invests in electric quads, bicycles, postal trains and lorries with double floors. Experiences and knowledge are being capitalised in separate spin off companies : a company for eco friendly driving (Mobigreen) and a company for durable transport (Greenovia). Sustainable activities are no differently affected by the current economic crisis than any other activities according to Wiener. However, Sustainable Development and is here to stay. It will continue to grow. At La Poste it contributes to the companies competitive advantage : By choosing sustainable processes and services La Poste can stay ahead of competition. And customers and employees feel connected because of the social and environmental efforts made by the company. Sustainable objectives will become common practice. It is Wieners expectation that all companies will eventually chose sustainable goals. A good example that shows the road ahead is the nutrition firm Danone. With its mission statement it places sustainability in the core of the company’s strategy ‘Bringing health through food to as many people possible’. The company now sponsors nutrition and drinking water projects for children in developing countries like Madagascar and Bangladesh. Sources : 1. www.laposte.fr ; 2. ‘La Poste rapport d’activité et développement responsable, saison’ 2008 ; 3. ‘Voitures électriques’, article presse l’Etat et des entreprises pour une commande groupée, 17 02 09.